Oh, Nick Foles. If he could’ve even mustered up three more points I would have won all of my 50/50s. Instead, with him scoring only 8 points, I wont about 65% of my 50/50s. Still positive money but he really hurt me. It was an odd game, considering his accuracy and attempts he just couldn’t find the end zone against a bad Pittsburgh defense (See Full Results Below). Alas, I ended with 129 points. This week, I’m still teetering back and forth a bit due to injury news. 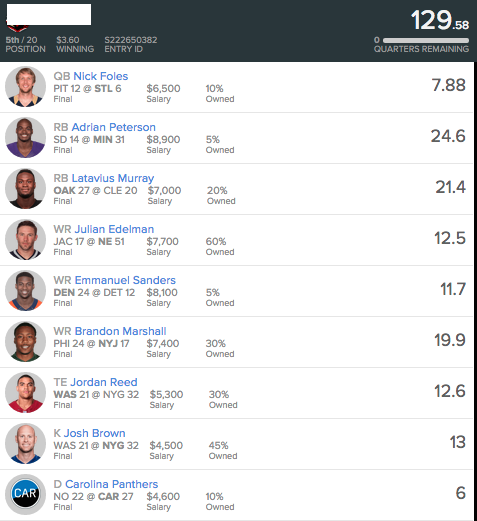 I’d really love to get another value play at RB like Freeman last week and I’m hoping this week it’s Karlos Williams – but until further news, this is my current lineup (check back in before LU lock on Thursday). I really like Tyrod again this week but Carr is $600 cheaper and he’s facing the Bears. He’s been throwing the ball great and Amari Cooper has been outstanding in his rookie campaign. I really believe Carr will approach 20 points, more than gaining value. I couldn’t help myself. After more research, it really is absurd to me that Rodgers is only $9,200 and he’s facing the 49ers. I wasn’t in love with Carr and there is plenty of depth at WR to allow me to play Rodgers. I feel 270 and 2 TDs are a floor against San Fran. If he’s good to go Eddie Lacy is almost a must play. He’s grossly underpriced and the Packers should dominate this game. Lacy should be looking at 20 touches and goal line work. I did have to scratch Lacy but it appears LeSean McCoy will not be playing and Karlos Williams is now a must for me. He’s been brilliant even sharing time so I’m anxious to see what he does with a full work load to himself. Latavius Murray is currently my RB #2. I typically don’t like playing a QB and RB from the same team but it’s a solid matchup and Murray is getting a ton of touches in this offense right now. Not play Carr now so this issue is moot. He’s explosive and is part of the passing attack. Not many feature backs have a good matchup this week. I will play Julio every week if possible. Normally I feel this way about Brown as well but having Vick throwing this week worries me a bit. Julio leads the league in targets and he’s always a potential for 30 points. I found a lineup that I like with him involved, even if I have to risk playing the Buccs defense. Hopkins is super explosive for only being $7900 (probably due to his QB being Mallet). The Falcons surprisingly enough haven’t given up a ton of WR fantasy points but for the price I’ll take the chance against a typically shaky secondary. Currently I have Rishard Matthews in at WR#3. He’s been very active early this season and is getting plenty of targets from Tannehill. It’s not a great matchup but Revis should shut Landry down allowing for more chances for Matthews. It’s worth a shot at $6400. I don’t often pair WRs and QBs in cash but I don’t have a problem doing it with Jones, especially at a 6k price tag. I expect Rodgers to have a solid game and I’m hoping Jones take in 6 receptions. He could be boosted with Adams missing time. Steve Smith has been killing it this season and the Steelers passing defense is atrocious. He shouldn’t have any problem reaching value. Flacco loves the deep ball and Smith has been targeted 40 times already this season. To round it out, I have Clay at TE. I do like Reed again this week but I couldn’t quite make it work with his extra salary. Perhaps if I can play Karlos Williams at RB that will free up the necessary money. I like Clay though facing a giants team that doesn’t guard TEs all that well. Tyrod has looked his way a fair amount this season and I expect the same in this game, with hopefully a TD in there. So as I mentioned I wanted to play Reed and Karlos is looking good so I’ll upgrade to Reed. Cousins has looked his way a lot giving the (fairly) cheap TE a decent floor. Well apparently this hurricane could cause issues and I’m not taking any chances considering my tournaments lock on Thursday night. I’m going to be playing MAX WILLIAMS instead. Good luck! When it comes to K/DST I typically just spend what I have money left on. After changing to Max Williams I had the money to play Arizona at defense and I feel good about that choice. They are one of two defense I wanted to play this week (Seattle being the other). Again – I’m really waiting on McCoy news so be sure to check back in throughout the week. Good luck! Who would you replace Steve Smith with ? These picks are from last week – I will be posting my picks for Week 5 later today.